This article is about the modern canal. For the original Grand Union Canal that forms part of this canal, see Grand Union Canal (old). Bedford & Milton Keynes Waterway? 3 The Birmingham "main line"
With competition from the railways having taken a large share of traffic in the second half of the 19th century, improvements in roads and vehicle technology in the early part of the 20th century meant that the lorry was also becoming a threat to the canals. Tolls had been reduced to compete with the railways, but there was little scope for further reduction. The Regent's Canal and the Grand Junction Canal agreed that amalgamation and modernisation were the only way to remain competitive. A 5-mile (8-km) section of the Oxford Canal forms the main line of the Grand Union between Braunston and Napton. Although the Grand Union intended to buy the Oxford Canal and Coventry Canal, this did not take place. The section of the main line between Brentford and Braunston (formerly the Grand Junction Canal), was built as a 'wide' or 'broad' canal – that is, its locks were wide enough to accommodate two narrowboats abreast (side by side) or a single wide barge up to 14 feet (4.3 m) in beam. However, the onward sections from Braunston to Birmingham had been built as 'narrow' canals – that is, the locks could accommodate only a single narrowboat. An Act of Parliament of 1931 was passed authorising a key part of the modernisation scheme of the Grand Union, supported by Government grants. The narrow locks (and several bridges) between Napton and Camp Hill Top Lock in Birmingham were rebuilt to take widebeam boats or barges up to 12 feet 6 inches (3.81 m) in beam, or two narrowboats. The canal was dredged and bank improvements carried out: the depth was increased to 5 feet 6 inches (1.68 m) to allow heavier cargoes, and the minimum width increased to 26 feet (7.9 m) to enable two boats of 12 feet 6 inches to pass. 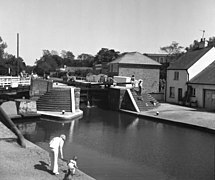 Lock works were completed in 1934 when the Duke of Kent opened the new broad locks at Hatton, and other improvements finished by 1937. However, these improvements to depth and width were never carried out between Braunston and London. Camp Hill Locks in Birmingham were not widened, as it would have been very expensive and of little point, since they lead only to further flights of locks not in the ownership of the Grand Union. A new basin and warehouse were constructed at Tyseley, above Camp Hill, to deal with this. Although the Grand Union company had a number of broad boats built to take advantage of the improvements, they never really caught on and the canal continued to be operated largely by pairs of narrow boats, whose journeys were facilitated by the newly widened locks in which they could breast up. The three sections between Norton junction and the River Trent (collectively known as the 'Leicester line') are mixed in size. From Norton to Foxton, the route is a narrow canal. From below Foxton to Leicester it is a wide canal. From Leicester to the Trent, the route is effectively the River Soar and the locks and bridges are wide. Another Act of 1931 authorised the widening of the locks at Watford and Foxton, but with Government grants for this section not forthcoming, the work was not carried out. The Grand Union Canal was nationalised in 1948, control transferring to the British Transport Commission, and in 1962 to the British Waterways Board, later British Waterways. Commercial traffic continued to decline, effectively ceasing in the 1970s, though lime juice was carried from Brentford to Boxmoor until 1981, and aggregates on the River Soar until 1996. However, leisure traffic took over, and the canal is now as busy as it ever was, with leisure boating complemented by fishing, towpath walking and gongoozling. More recently freight traffic has returned with the carriage of aggregates from Denham to West Drayton in barges and narrow boats, and the opening of a new wharf for re-cyclables and aggregates at Old Oak Common. One end of the Grand Union Canal (Grand Junction Canal – Main Line) is at Brentford on the River Thames in west London, where the canal follows the engineered course of the Brent. 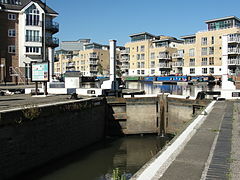 The double Thames Lock at Brentford separates the Tideway administered by the Port of London Authority from the River Brent/Grand Union Canal, administered by the Canal & River Trust. The locks on the canal are partially numbered: numbered consecutively south of its turn-off for Leicester, Braunston Junction. Thames Lock is lock number 101. 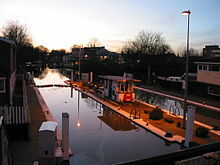 For more than 3 miles (4.8 km) upstream of Thames Lock, the canal and the Brent are one and the same, and the waterway is semi-tidal until the double Gauging Lock (lock 100) at Brentford. Just upstream of the Gauging Lock was a large canal basin, now known as Brentford Lock, from which the canal covers more distance passing through two more locks. 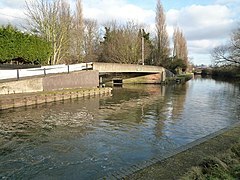 The river and canal part at the base of the Hanwell flight of locks (92–97), before two more locks take the canal to Norwood Green. It then heads westward over level ground through Southall, Hayes and West Drayton until it reaches the gentle valley of the Colne. Three miles (5 km) from Norwood on this long level is Bulls Bridge Junction, once the site of the Grand Union Canal Carrying Company's main dockyard. At Bulls Bridge, the Paddington Arm branches off to the north and runs 12 miles (19 km) to join the Regents Canal at Little Venice (see below). Just before Uxbridge is Cowley Peachey Junction, where the Slough Arm branches off westward. At suburban Cowley, before the 1930s a rural village, the canal begins to climb the valley of the River Colne north north-west into the adjoining town of Uxbridge. After Denham and Harefield villages, it passes to the south of Rickmansworth. Here it merges with the Rivers Chess, Colne and Gade. After Rickmansworth, the canal follows the valley of the Gade, passing the site of Croxley paper mill. The canal skirts Watford through Cassiobury Park, passing under the M25 motorway as it approaches Kings Langley. Locks become more frequent as the climb into the Chiltern Hills steepens. The original four locks here were replaced in 1819 by five shallower ones to alleviate problems with water supply to the nearby paper mills. This realigned the canal to the south of its former course; the locks here are still referred to – without irony – as "The New 'Uns" by traditional boaters, and the term has been passed on to a new generation of canal users. After Kings Langley and Apsley – the site of more former paper mills – the canal passes the town Hemel Hempstead and Boxmoor Common. From here the canal follows the course of the River Bulbourne through Bourne End with the well-known swingbridge at Winkwell, and the "Port of Berkhamsted, a small compact town". At Cow Roast Lock the canal reaches the 3-mile (5-km) summit at Tring in the Chiltern hills, having risen through 54 locks since Brentford. At the north-west end of the summit level is Bulbourne Works, where lock gates were manufactured until 2003 for the southern canal network. Half a mile (800 m) further on, the canal reaches the top of the Marsworth flight of seven locks, which begin the descent to the Vale of Aylesbury. A Wendover Arm branches off westwards from the summit level under a bridge adjacent to Marsworth Top Lock and is currently navigable for just over a mile to moorings and a winding hole; it has restoration project to extend it back to Wendover. This part of the canal in parlance used by natives and canal staff was "the withered arm" and in fact was only really "opened" to allow the pumping station there to pump water into the uppermost level. A few hundred metres beyond the bottom lock of the flight, the Aylesbury Arm branches off to the south west. The Grand Union crosses the wide valley gradually, descending by interspersed locks past the villages of Cheddington, Horton and Slapton until it reaches Leighton Buzzard. Traditionally this section of the canal is called "Slapton Fields" or just "The Fields" by boaters. A few miles further on it enters Milton Keynes at the outskirts of Bletchley at Fenny Stratford Lock, which is unusual in lowering the level by only 12 inches (30 cm). The next stretch of 11 miles (18 km) is on the level. A 21st century plan (see below) to dig a new arm from here to the Great Ouse at Bedford. North of the centre, it traverses the modern New Bradwell Aqueduct, the first on the Grand Union in over 100 years. Leaving Milton Keynes at Wolverton, the canal runs on a high embankment before passing over the Great Ouse at Cosgrove "Iron Trunk" aqueduct. After rising through Cosgrove Lock, (and passing the start of the abandoned Buckingham Arm) another long level section brings the canal to the bottom of the Stoke Bruerne flight of seven locks. At the top of this flight is the Stoke Bruerne Canal Museum followed shortly by Blisworth Tunnel, at 3,056 yards (2,794 m) one of the longest of UK canals. Once clear of the tunnel, the canal passes Blisworth village and reaches Gayton Junction where the Northampton Arm branches off to the east. This arm has 17 narrow locks as it descends to join the navigable River Nene (see below). The long level stretch continues past several villages including Nether Heyford and Weedon Bec and is very rural in character. At Whilton, the canal reaches the bottom of the Buckby flight of seven locks which raise it to Braunston summit the village of which parish is 5 miles (8.0 km) away. Beyond the top lock is Norton Junction where the Leicester line (not strictly a branch) heads off north. 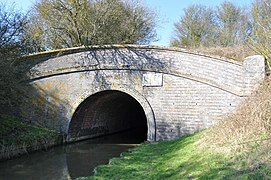 A few miles further on the canal passes through the 2040-yard (1865-m) Braunston Tunnel, which pierces a low range of hills that are part of the Northamptonshire uplands. The canal then drops down the Braunston flight of six locks until it reaches Braunston Junction having covered just over 93 miles (150 km). At Braunston Junction, the Oxford Canal diverges north and south. The north section leads to Rugby and Coventry; the southward fork carries both the Oxford Canal and the Grand Union for 5 miles (8.0 km) to Napton Junction. Here, the Grand Union heads north towards Birmingham, while the Oxford Canal veers south towards Banbury and Oxford. 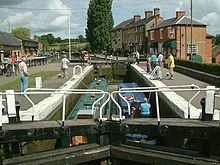 Shortly after Napton Junction, the Grand Union reaches three locks at Calcutt, which begin the descent to the Warwickshire River Avon. After a 3-mile (5-km) level, the canal descends into the valley of the River Leam by the Stockton flight of 10 locks (often known as 'the Itchington Ten'). Above the eighth lock down the flight, a short arm (now used as pleasure craft moorings) used to serve Southam cement works. From the bottom of the locks, a 3-mile (5-km) level leads to the four Bascote locks. The top two form a 'riser' or staircase. Six more interspersed locks lead to Radford, after which a 5-mile (8-km) level takes the canal through Leamington Spa to Warwick. Between these two towns, the canal crosses the River Avon and the former Great Western Railway on aqueducts. At Warwick, the canal rises by two locks to Budbrooke Junction (formerly the junction with the then-independent Warwick and Birmingham Canal). To the left is the restored Saltisford Canal Arm, a short stretch that used to run under the railway to the original canal basin complex and terminus of the Warwick and Birmingham Canal – the basin was filled-in in the 1970s. The canal used to serve the oldest gas works in the world and several unusual hexagonal buildings remain opposite Sainsbury's. After half a mile the mainline reaches the bottom of the Hatton flight of 21 locks that lift the canal up out of the Avon Valley. The first 10 locks are spaced out but from the middle lock the flight is tightly spaced. Three miles (5 km) from Hatton Top Lock the canal passes through Shrewley Tunnel, with its separate horse tunnel, and then passes Rowington village to Kingswood Junction where a short spur connects with the Stratford-upon-Avon Canal. Another 3 miles (4.8 km) lead to the Knowle flight of five locks. Finally, an 11-mile (18-km) level takes the canal through Elmdon Heath, Solihull, Acocks Green and Tyseley to the heart of Birmingham. The main line may be considered to terminate at Bordesley Junction. From here, there are two routes, both part of the Grand Union Canal. The original line of the Warwick and Birmingham Canal leads to the Digbeth Branch Canal of the Birmingham Canal Navigations at the Warwick Bar, while the later line of the Birmingham and Warwick Junction Canal leads to the Birmingham and Fazeley Canal (and Tame Valley Canal) at Salford Junction, which in turn has connections to the Coventry Canal and the Trent and Mersey Canal. † Diagram not to scale. Selected features. Saddington Tunnel on the Leicester Line. Formed by amalgamations of once-independent canals, the 'Leicester Line' of the Grand Union Canal runs north from Norton Junction for about 35 miles (56 km) until it reaches Leicester, where it joins the River Soar to provide a link to the River Trent and to the Trent and Mersey Canal. It includes tunnels south of Crick 1,528 yd (1,397 m) and north of Husbands Bosworth 1,166 yd (1,066 m) The village of Crick is home to a popular annual boat show. The stretch of the canal that passes through the centre of Leicester is known as the 'Mile Straight' and is home to Leicester Rowing Club, a rowing and sculling club. The club hosts regattas on a stretch co-running with the Soar, typically held in mid-April by over 100 crews over a 770-yard (700 m) course. Also on this section are the Foxton Locks and Watford Locks, both staircase locks. Beside Foxton locks is the site of a long-abandoned inclined plane boat lift. This was constructed as part of a project to create a wide-beam canal route to connect the northern and southern parts of the canal system, something which does not exist to this day. 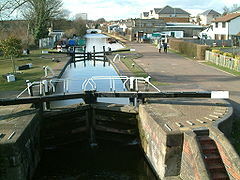 Funding to deal with the narrow locks at Watford was not forthcoming and the scheme was aborted. The canal north of Foxton Junction is wide-beam to Leicester and onwards. It was originally intended to build a canal at this width all the way to the River Nene at Northampton. However, that canal never went further than the basin at Market Harborough. The Leicester Line continues along the River Soar Navigation, and reaches the River Trent at Soar Mouth, north of Ratcliffe-on-Soar. 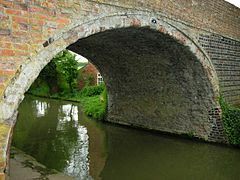 It is possible to continue to the Trent and Mersey Canal, Coventry Canal and North Oxford Canal, to complete a circuit known as the Leicester Ring. The Grand Union Canal has six main branches, usually termed 'arms'. 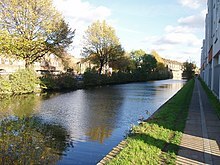 Five miles (8 km) from Brentford, the Paddington Arm runs circuitously on the flat to a lock and a junction with the Regent's Canal, the latter running north and east of Central London. 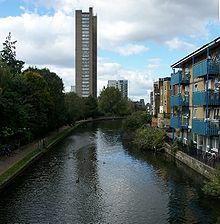 The triangular basin formed by the junction is called Little Venice, Maida Vale. The Arm's final 500 m runs south-east to Paddington Basin. From Cowley Peachey, the Slough Arm runs 5 miles (8.0 km) to the west. From Marsworth, about 35 miles (56 km) by canal from Brentford, two arms diverge: one to Wendover (currently in-part navigable as being restored by the Wendover Arm Trust;) the other descends through 16 narrow locks for 4 miles (6.4 km) to Aylesbury. From Gayton Junction, about 60 miles (97 km) from Brentford, the Northampton Arm links with the River Nene. At Warwick the northern-most branch off of the Grand Union Canal (also known by regular users as the "GU"), the Saltisford Canal Arm begins. The restored arm is close to the centre of Warwick. It was originally the main line of the Warwick and Birmingham Canal, 1799, leading to the terminus and a basin with wharfs for timber. When the Warwick and Napton Canal opened, this bypassed channel remained as the town's wharf. The Saltisford Canal Trust have restored most of the surviving canal, 1990-2015, such as installing long lengths of sheet piling and restoring a warehouse in 2007. Its last 160 yards (150 m) were lost in the 1970s saving a disused road bridge that stands isolated in a car park. Warwick's narrowboat moorings are on the Arm by a public park partly in view of the Castle. Over 800 visiting narrowboats cruise to Warwick each year and moor on the arm. The Leicester Line has two modest arms of its own, see Grand Union Canal (old). The Bedford and Milton Keynes Partnership (B&MK) plans to build a 16-mile (26 km) canal connecting the Grand Union at Milton Keynes to the River Great Ouse at Bedford at an estimated cost of £170 million. The project is supported by British Waterways (and its successor, the Canal & River Trust), the Bedford & Milton Keynes Waterway Trust, other waterways campaign groups, and also local councils. The first element of the canal is an underpass under the A421, completed in 2009 and efforts are continuing to obtain funding to complete the scheme in 'bite-size chunks'. The new waterway would create a new cruising ring connecting through from the Grand Union to the waterways of East Anglia which are beneficial to leisure cruising as boat hirers are able to take circular routes. The project was first discussed in 1810 when its promoters included Samuel Whitbread. From Milton Keynes, the canal is planned to pass beneath the M1 utilising an existing cattle creep, then cross over Brogborough Hill, and across the Marston Vale through to the River Great Ouse in Kempston. The Buckingham Arm once ran from Cosgrove, Northamptonshire to Buckingham. It was built as an arm of the Grand Junction Canal, in two separate phases, opening in 1800 and 1801. It was disused from 1932, but was not finally abandoned until 1964. It is now the subject of a restoration project. The predecessor to the Canal and River Trust, British Waterways, received mild financial support indications from the two local authorities covering Slough and Eton, Berkshire to extend the Slough Arm to join the Thames, via any course i.e. covering a minimum 2 miles (3.2 km); the 2008-estimated cost was £30 million. The trust confirmed in 2012 this remains a long-term objective, to be actioned when the economic conditions allow. Bulky shining sculpture or landmark, Liquidity erected 2002 at the apex Ferry Wharf, Brentford, marking a then-dry entrance to the Grand Union Canal from the River Thames's Tideway as at low tide. ^ "The Grand Union Canal Holiday Cruising Guide and Map". www.canaljunction.com. ^ The spellings Bull's Bridge and Bulls Bridge are both used. ^ "Canalcuttings.com article on GUC". ^ "Wendover Arm Trust". Wendover Arm Trust. ^ a b c "B&MK Waterway Trust". 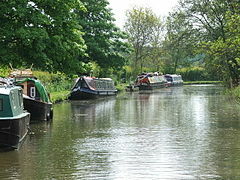 ^ "Route chosen for £150m link canal". BBC News. 28 February 2003. ^ Brown, Paul (28 February 2003). "First British canal for 100 years announced". The Guardian. ^ "The Route | B&MK Waterway Trust". B-mkwaterway.org.uk. Retrieved 16 June 2013. ^ "Plan to link canal with Thames". Sloughobserver.co.uk. 1 November 2008. Archived from the original on 27 September 2013. Retrieved 16 June 2013. ^ "Activists back canal link plan". Sloughobserver.co.uk. 6 November 2012. Retrieved 16 June 2013. 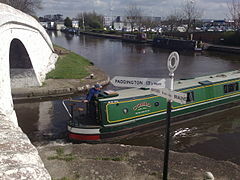 Wikimedia Commons has media related to Grand Union Canal.